The Breville 800CPXL is the world's first active-arm citrus press and is equipped with the Quandra-Fin juicing cone that juices any size citrus fruit, from limes to grapefruits. Sensors built into the soft-grip handle monitor the arm position and safely activate the spinning cone as it comes in contact with fruit. The unique Quandra-Fin juicing cone features four strategically positioned multi-tiered fins that eliminates the need to change cones. The sleek die-cast stainless steel juicing cone and metal body add elegance as well as protect againt corrosion for a lifetime of juicing. 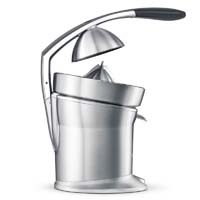 This citrus press also features a drip-stop juice spout that can be flipped upward after juicing to halt the flow of juice, a coarsely pored stainless steel filter for pulp control and Breville's exclusive Assist Plug that features a built-in finger hole for safe and effortless removal from the outlet.